Preventative dentistry is the key to having a beautiful, confident, and healthy smile. Preventative dentistry works to preserve the natural dentition and supporting structures by preventing the onset, progress, and recurrence of dental diseases and conditions. At Heritage Park Dental, we will help you establish a prevention program consisting of regular dental exams, cleanings, x-rays, and other possible preventative treatments such as dental sealants and fluoride treatments. Dr. Shadi Heidarian and her dental staff are committed to coordinating with you to develop an ideal prevention program. Full mouth restorations can cost an upwards of $45,000. Preventative dentistry, along with a good oral health routine, can literally save you thousands of dollars. Taking small steps to prevent dental issues decreases the chances of developing expensive dental problems. What can I expect during my routine dental exam? If you are a new patient, your dental exam will begin with a discussion about your medical history, current medications, and allergies. If you are a continuing patient, you will need to discuss any changes in your medications or if any new allergies have developed. This information is essential to develop an ideal treatment plan. Once this information has been discussed, Dr. Shadi Heidarian will examine your mouth. She will check your teeth for signs of decay or damage, and your gums for any signs of disease. She will also perform an oral cancer screening on the soft tissue structures in your mouth. Your bite and jaw functioning will be evaluated as well. Finally, she will discuss any findings with you, answer all your questions, and make any necessary future treatment plans. 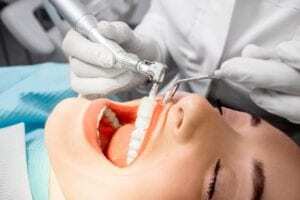 What can I expect during my routine teeth cleaning? Your routine teeth cleaning will begin with our dental hygienists using a scaler to gently scrape the plaque and tartar from your teeth. While plaque can be removed through brushing and flossing, tartar can only be removed by a scaler. Once the plaque and tartar have been removed from your teeth, our hygienists will brush your teeth with a gritty toothpaste and then floss to remove any remaining debris. You will be asked to rinse your mouth with liquid fluoride. Finally, our hygienists will apply a fluoride treatment to the surface of your teeth by first inserting a tray will foamy gel into your mouth and then painting on a fluoride varnish. Dental x-rays are a key diagnostic tool used by Heritage Park Dental. They can identify dental issues that are not visible during an oral exam, such as cavities between teeth, impacted wisdom teeth, and issues affecting the jaw bone and joint. Dental x-rays usually consist of biting down on a plastic square, only last a few minutes, and have a minimal amount of radiation. They are completely safe and highly recommended as a diagnostic tool in preventive dentistry. What other preventative treatments are available? Fluoride works by binding with the calcium in your tooth’s enamel, creating a stronger surface. When you ingest sugars or carbs, bacteria feed on these substances and produce acid that wears down your enamel, making it easier for bacteria to get in. In strengthening your enamel, fluoride prevents bacteria from permeating your enamel. There are two different types of fluoride. The first type is topical fluoride, which is applied to the outside surface of the tooth. Topical fluoride is usually applied through toothpaste or as a fluoride treatment. The other type is systemic fluoride, which is ingested through the body. The most common form of systemic fluoride is public drinking water, however it can also come in supplement forms. Should I be practicing preventative home treatment? Yes! While Heritage Park Dental can help you with professional preventative measures during your office visits twice a year, the remainder of preventative measures are up to you. The best at-home prevention technique is to keep up your oral routine of brushing twice a day and flossing once a day. Another important preventative measure is to eat a balanced diet to ensure your teeth are getting the nutrients they need. Foods high in calcium are especially beneficial to your teeth and gum health. Also, reducing your sugar and carb intake will reduce the amount of plaque-causing bacteria. You will also want to avoid habits that can be detrimental to your oral health, such as smoking or drinking. Both can cause your mouth to become dry, discolor your teeth, contribute to excess plaque, and can lead to disease or oral cancer. 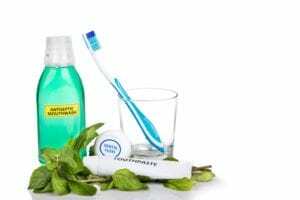 What types of dental products should I be using at home? For your daily dental routine you should be using a toothbrush, toothpaste, and floss. Your toothbrush should have a small to medium head that can be easily maneuvered throughout your mouth. The bristles should be soft, as excessively hard bristles can actually damage your enamel and cause more problems. An ideal toothpaste is one that contains fluoride and has been approved by the American Dental Association. To tell if a toothpaste is approved, look for an ADA seal on the package. There are also types of toothpaste that can whiten teeth or reduce sensitivity. Depending on your individual needs, these may or may not be the best fit for you. Whitening toothpaste can be tough on enamel and can cause additional sensitivity. Talk to Dr. Shadi Heidarian about which toothpaste is best for your individual dental needs. Finally, you will want to use floss daily. There are two main types of floss: waxed and unwaxed. Waxed floss is a single filament that tends to be stronger, but can’t fit easily into tight spaces. Unwaxed floss has multiple filaments and can easily fit into tight spaces, but can break or fray easier than waxed floss. To boost your oral health with preventative dental services, schedule a consultation with Dr. Shadi Heidarian of Heritage Park Dental today! Heritage Park Dental serves Palo Alto and the surrounding communities.